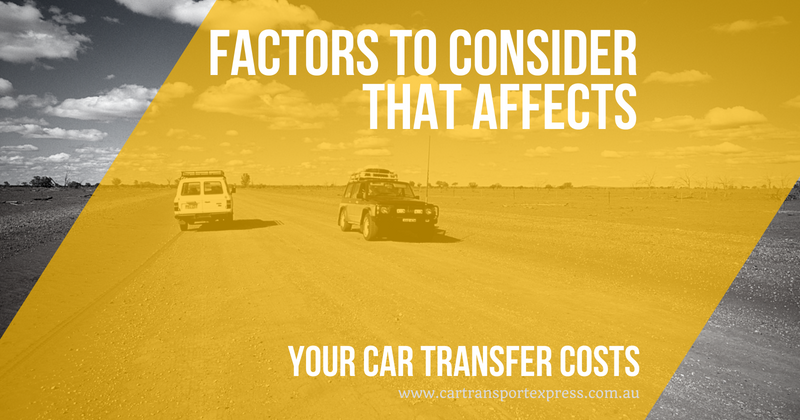 What are the factors that make costs of car transfer Australia vary? So you’re moving your car and stuff to another state or location, and you’ve decided to avail car transfer Australia services to handle your vehicle shipping. However, you’re at a loss for what to do since the actual car shipping costs of the companies change from time to time. How come they don’t have a fix or constant rate for their services? A lot of factors may have contributed to the varying costs. In this post, we’ll guide you on how to estimate your car shipping costs before you avail a car transport services. Of course, the quote for your car shipping will vary depending on the distance of transportation. The longer the distance you have to travel, the higher the price, even more so if you’re moving from one state to another state. Keep in mind that you may also have to pay some taxes as you travel interstate. Aside from that, the mode of transportation will also play a factor in your quote. For example, you may opt to include port to port, door-to-door delivery, or pick and drop facilities. The size and weight of your vehicle also greatly affects your car transport quote. For example, if you’re only shipping personal cars, then you can certainly save more costs. However, it’ll be a different story if you’re going to ship vans, boat, or if you intended to use car shipping for your buy and sell car business. Furthermore, the model of your car also matters. Large vehicles like SUVs cost more than a Sedan car. Most cars these days are modified to satisfy the owner’s personal needs. This can affect your transportation costs since car transfer Australia will have to cover the insurance costs for these custom modifications. Furthermore, a non-working car costs more than a working car (used for business purposes) since it takes more effort in loading and unloading your vehicle than a working one. Aside from that, new and premium cars generally cost more than the old one due to its insurance cost. Do you prefer to have your car transported in an enclosed layer to offer more protection? Or do you want an open one? Close type of transactions will definitely cost you more since the car transport company will enclose your vehicle in a separate trailer to protect it. However, you can be assured that your car will be free from dirt, dust, and other damages. If you’re on a tight budget, you can opt to choose open auto transport where it only uses a standard shipping method, which can greatly reduce your shipping cost. Of course, the fluctuating fuel price plays a significant role in determining your car transfer Australia cost. You’ll most likely find your price had gone up the moment you avail a car transport services compared when you canvassed for the price a week ago. If you happen to book the service while the fuel is low, then consider yourself lucky! Of course, the transportation cost will also be affected by your preferred shipping speed. Do you want to see your car the soonest possible after you’ve moved out? Are you in a rush to get your car within 2 days? Or are you willing to wait for a week since you’re in no rush? A lot of car transport companies offer standard and express shipping options, but the latter will definitely cost you an additional fee. Why Avail Car Transport Services When You Can Drive Your Car By Yourself? What Will the Future of Car Transport Look Like? © 2017 Car Transport Express. All Rights Reserved.